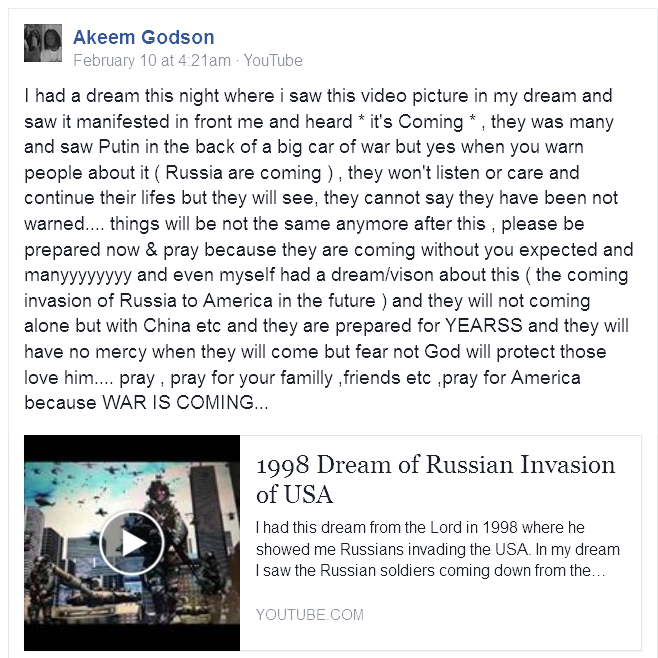 I had this dream from the Lord in 1998 where he showed me Russians invading the USA. In my dream I saw the Russian soldiers coming down from the mountains. At the time of the dream I did not live anywhere mountains. Today I live in a mountain area. They had green uniforms with red socks. She saw a map of California where San Fransisco was highlighted. Time passed, and she understood there was people in America who survived the Russian slaughter. At some point she was badly beaten, tortured and naked. jay dee–i too had a dream around the same time. i was i think 10-12. only it was not only Russia but china was with them. She is in an airplane where she could view Los Angeles. All of a sudden the buildings just crumbled. The plane couldn’t land on the landscape, so the plane landed on the water. Missiles were falling from east to west. In the dream she saw people sleeping in barns and in the dirt. She was one of those people. The cities were blown up and the countryside had hope for food. Families were split up and looking for each other. Nancy’s Vision Of Food Lines In America In Cold Winter – Why God?